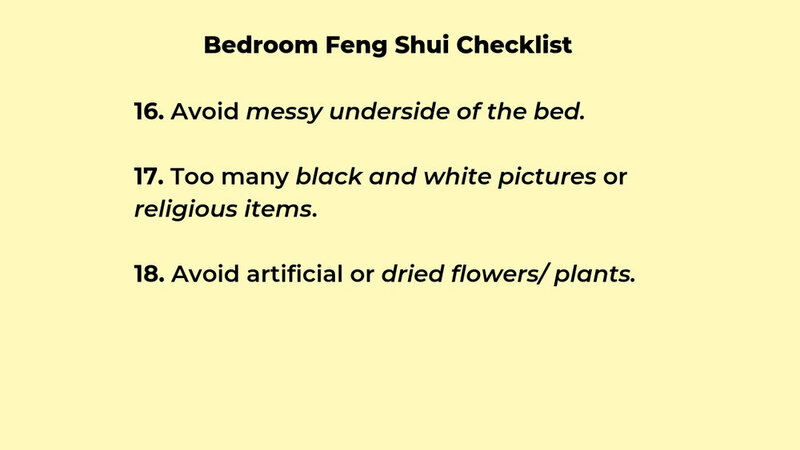 Here are the common mistakes and Feng Shui issues when designing a bedroom. Use it as a guide or checklist. Most of them can be resolved by moving the furniture and change the layout. Watch the video below or read on. A room within a room indicates the tendency to have a third person in your relationship. 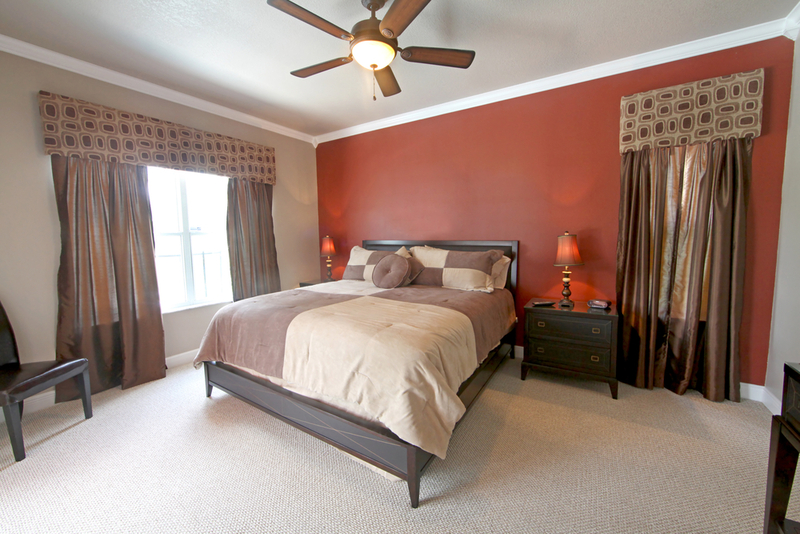 It is very common to have a restroom or a big closet room within a master bedroom. 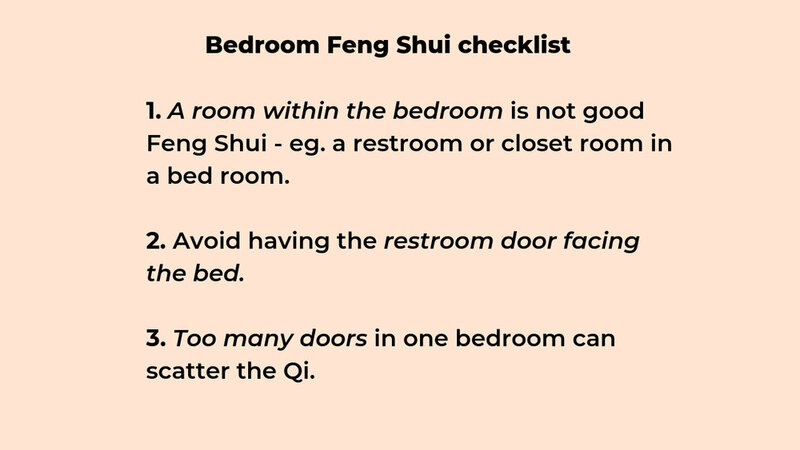 Just know the tendency from Feng Shui perspective. The restroom door pointing to the bed might be harmful to the health. And too many doors in one room can scatter the Qi around and weaken the Qi. Reflective surface and mirror should be restricted in the bedroom. If you can see them from the bed, it might disturb your mind when waking up at midnight and see your own reflections. If a mirror is facing the door, it has the same effect when you walk through. 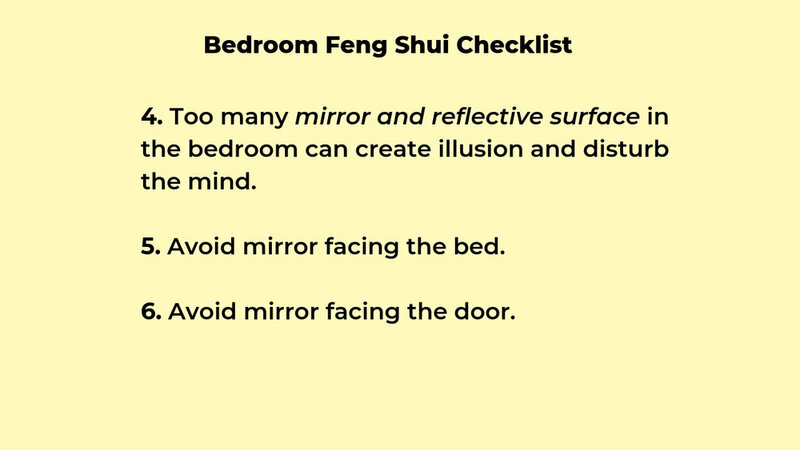 But if the mirror or reflective surface is not directly facing the bed or the door, it is OK. If you can not change the location of the mirror, you can cover it with a piece of fabric or move the mirror inside a closet. 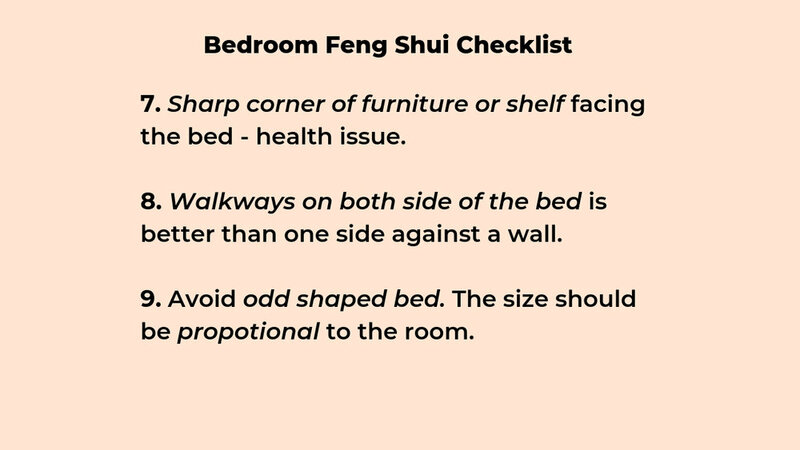 The sharp corner of freestanding furniture (such as a closet or cabinet) pointing to the bed creates Sha Qi and can be harmful to the health. It is the same as the open shelf on the wall. The sharp edge looks like a knife pointing to the bed. It is best to leave both sides of the bed some space to walk around. When you lie down in bed, the left side represents the male energy (dragon), and the right side represents the female energy (tiger). If one side of the bed is against a wall, the relationship with that gender can be compromised. Some beds have a special design that might include an odd shape or angle. It might affect the peaceful rest of the person. The size of the bed should also be proportional to the size of the room. Big space can accommodate a bid bed, and small space requires a smaller bed. For the master bedroom, some new parents like to connect a kids bed for the new baby. 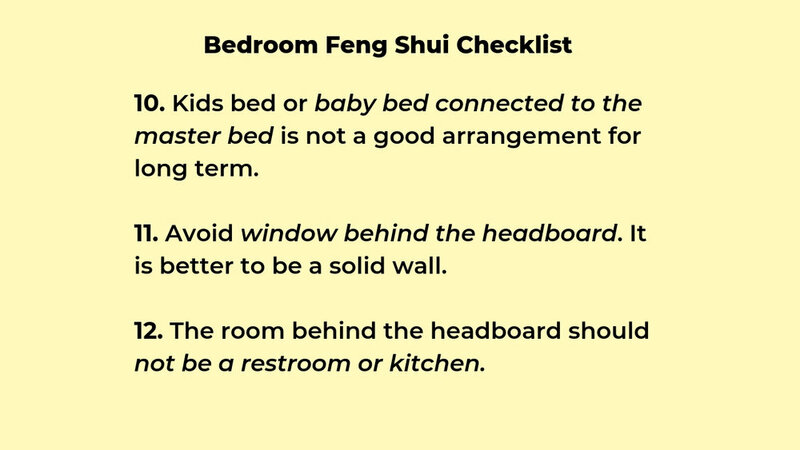 It is ok for a short time, but not a good Feng Shui for parents’ relationship if it becomes long term. An extra bed is indicating a third person in your relationship. The bed should not be placed under a window. Behind the headboard, it is best to have a solid wall for support. Behind the headboard, the next room should not be a restroom or kitchen because of the noise. It might affect your clear thinking. When lying down, your feet should not point to the door or low window directly. The bed should be private and not be seen easily from outside. Floor to ceiling window can be overkilling for a bedroom. In Feng Shui, the living room and public space should be brighter and bigger than the bedrooms. If it has too many big windows, the Qi cannot stay and money Qi is weak. If the bed is too close to a floor to ceiling window, it can feel insecure. Add some furniture or more curtain to reduce the size of the big window. A ceiling fan directly above the bed can create stress and affect health. It can also scatter the Qi so positive Qi cannot stay. Move the ceiling fan away from the bed if you must use it. Keep the underside of the bed clean so the energy is clean and circulating. Avoid displaying too many black and white pictures, headshots, or religious items in a bedroom. It might be too harsh and not suitable for a bedroom. Artificial flowers and plants are ok for temporary display, but the real one is always better. A bedroom is not the best place to keep a lot of plants. Some fresh flowers or small indoor plants are fine. Anything has energy. If you accumulate too many stuff and can not let go of the outdated clutter, the outdated energy can block your current luck. Regularly clean out unwanted objects in the house can leave room for better things to happen. Don’t place a bed under a beam. It creates pressure and can affect our mind. Rearrange the bed or disguise the beam can help. The bedroom and bed should be in an auspicious direction of the year to receive the best energy. 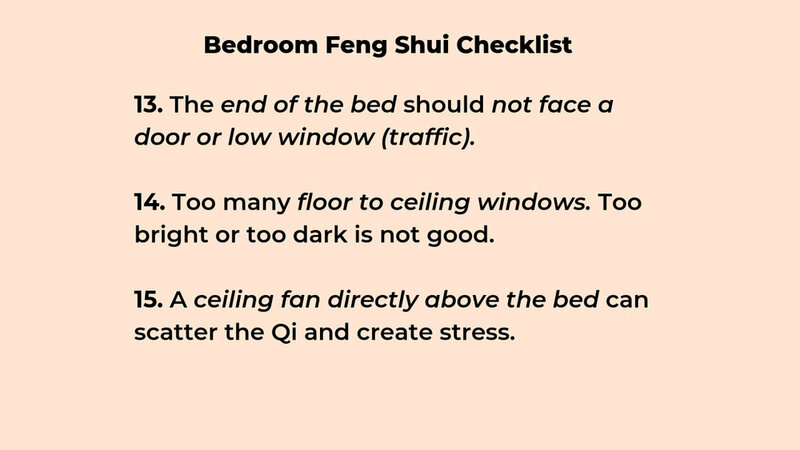 It can be based on any Feng Shui school or the yearly chart, At least, check the windows and doors to make sure the Qi coming into your house is positive and beautiful. 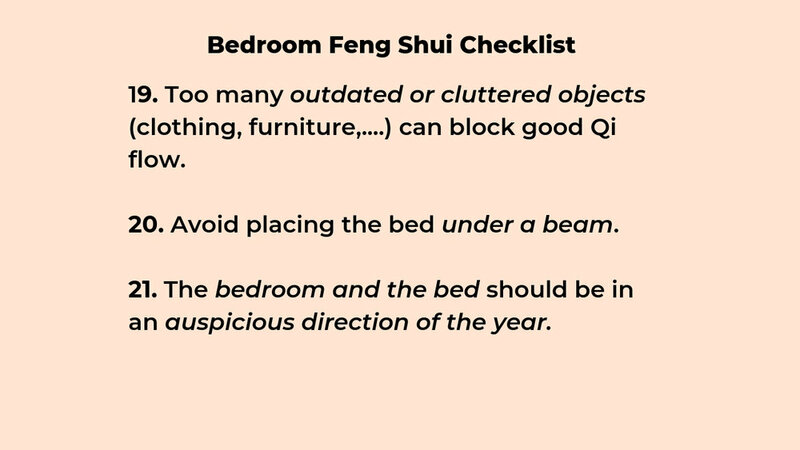 That is the 21-point checklist for the bedroom Feng Shui. If you can not meet them all, stay positive and know our attitude can overrule our environment.